Book Blogger Confessions: Book Tours and Cover Reveals Oh My! ~ Love.Life.Read. 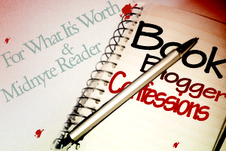 Book Blogger Confessions: Book Tours and Cover Reveals Oh My! June 3rd - Does participating in book tours/cover reveals and author guests post drive traffic to your blog? What type of problems have you encountered when hosting them? (please keep it civil - no names or calling specific people out) As a blog follower, are you ever turned off by these kinds of posts? How much publicity is too much? I have only participated in one cover reveal thus far and it was for a book in a series that I enjoy--Georgetown Academy. I was happy to participate in it and it would be something I would continue to do as the publisher/publicist have been great to work with the entire time. I do think that some blog tours can get to be too long--after a while, I glaze over them because I do not know what other information will be new. I do enjoy reading multiple reviews for new-to-me titles though, so it is a little hypocritical of me to say I get tired of reading the same information on long blog tours. ;-) To me, it is a different case. What about you--do you like blog tours? Do you participate in them? I just commented that most people said they don't bother following many tours after awhile because they don't find new content. I wonder if there has been a study to see if they still work/help sell a book or if the days of the big tours/cover reveals are winding down. It certainly can help lesser known authors but you don't want it to backfire on them either. I agree, it definitely is a fantastic way for lesser known authors to get their name and book out to the masses. I just do not personally have the time or inclination to follow longer blog tours. Usually, once a title sparks an interest in me, I add it to my ever growing TBR list. If I am on the fence, I will look at multiple blogs to get a collective view of the title. I like participating in them to an extent. Lately, the past few ones I've participated in I haven't even read the book; just posted whatever the tour host has told me to. And I don't like that. I don't like pushing a book that I haven't read or don't like. I also feel like the hosts sometimes get way too pushy. I've had them pretty much dictate what I can and can't say. Which made the tour very uncomfortable. Sometime I do love is cover reveals; those are always fun because it's just saying "look at the pretties!" No fuss, no muss, just fun! Great question/discussion! That is what would make me most nervous, and why I have been reluctant to really get involved with them--the pushing me to do titles I have not read, nor want to and then dictating what the posts have to be on top of it. Cover candy is always a good thing. :-) Thanks for stopping by and commenting.